TORONTO, October 30, 2018 — The Burnie Group is pleased to announce #EDGETalks: Artificial Intelligence in Operations: Where Can AI Fit in My Organization? Featuring a keynote address by Mike Rhodin, former SVP at IBM and founder of IBM’s Watson Group. Mr. Rhodin’s 33-year career at IBM was infused with a passion for helping clients extract value from technology, improving business performance, and simplifying the way people work. Mr. Rhodin’s keynote will provide insight on the ways that artificial intelligence and automation are reshaping operations, augmenting human capacity, and changing the future of work. “AI has been called the fourth industrial revolution. It is hard to conceptualize just how incredibly transformative its potential is,” says Doug Heintzman, Head of Innovation at The Burnie Group. #EDGETalks: Artificial Intelligence in Operations: Where Can AI Fit in My Organization? will take place on the evening of Wednesday, November 7, 2018, at The National Club. Following the keynote address, we will have a fireside chat featuring Kathryn Hume, Frank Tsiribis, and Mike Rhodin. Frank Tsiribis – Head of Insight Strategies and Risk Management, Enterprise Infrastructure, Initiatives, and Innovation (EI3) at BMO Financial Group. Increasingly, companies are investigating the potential implications of AI on their enterprise, and if and how they should adopt it. This event will help separate hype from reality and fact from fiction. It will identify some key areas where AI is changing the way business is done. The Burnie Group is a Canadian-based management consulting firm that helps clients improve their businesses through the application of innovative strategy, rigorous analysis, world-class technology, and the continuous pursuit of operations excellence. The Burnie Group specializes in Strategy, Operations, Robotic Process Automation (RPA), Artificial Intelligence (AI), Blockchain, and Workforce Management (WFM). Our programs deliver measurable, transparent, and guaranteed results. This post is based on a panel discussion held on June 4, 2018. The 90-minute session focused on panellists’ experiences shaping culture and fostering engagement in their companies. Moderated by Darshan Jain, Head Technology and Operations of The Burnie Group, Norman Bacal, author and former managing partner, Heenan Blaikie LLP delivered the keynote and the panellists were Richard Anton, Senior Vice President and Chief Operations Officer at CIBC Mellon, Cathie Brow, Senior Vice President, Human Resources and Communications, Revera, Christina McClung, Vice President, Human Resources and Chief of Staff, Capital One, and Rob Lokinger, President and Chief Operating Officer, AppCentrica Inc. Many companies hire the best and the brightest to seize new opportunities and increase profits. Unfortunately, impressive résumés don’t always translate to an engaged employee base or a stimulating and innovative workplace culture. Individual contributors who once brimmed with enthusiasm and new ideas now only raise their heads to check the time. Regardless of systems put in place or reorganizations, teams struggle to get ahead. Culture and engagement can be forgotten or an afterthought when setting and executing corporate strategies. Leaders should consider the mindsets and behaviours needed to support their company’s vision and goals. How does culture fit within your corporate strategy? You need to define the workplace culture required for teams to meet targets and create new opportunities. Whether team-centric, focused on high potentials, honed on improving shareholder value, (etc. ), a culture strategy needs to be determined as well as its supporting tactics. Policies, programs, and behaviours must align with culture vision and not vary across your organization regardless of geography or environment. Employee trust grows when words and actions align. If you, your peers, or other leaders say one thing and do another, you risk damaging your and the company’s credibility. It’s easy to focus attention on only senior management or those with “star” quality. In fact, it’s the public’s or client’s first point of contact—receptionists, service agents, or call centre employees—who can be the linchpin to your organization’s success. They are often your company’s face and voice and some of your most valuable employees. Telling them you recognize this signals you understand their role and you appreciate what they do. It’s unlikely your staff will proactively tell you what’s happening or their collective mood. The best way to know these is to step outside your office and talk to employees. Have informal chats—saying “hello” and finding out how they’re doing or how their family is will help build goodwill and trust. Ask your leaders to do the same. We know a strong corporate culture can be a competitive advantage when attracting employees or securing clients. When a company decides to define or redefine their culture, change doesn’t occur overnight: it takes time to learn and develop traits and behaviours. While organizations can launch campaigns focused on ethics, teamwork, or client-centric service, successful shifts often happen when leaders commit to and model desired behaviours and attitudes. Engaged employees go above and beyond so the company realizes its corporate vision and strategies. Working isn’t “just a job” or a paycheque. They are front and centre when needed most. As individuals, they proactively update their skillset to be part of the organization’s future. They are active problem solvers and offer ideas to help shape the company. How do you build employee engagement? Smart strategies and tactics build, maintain, and grow engagement over time. They are rolled out at the corporate level and supported by leaders. Your corporate values should be defined, so everyone understands what they are and how to bring them life. You need to ensure all levels, especially C-suite and other senior leaders, walk the talk. Otherwise, employees will see the disconnection and may assume a double standard. Find different ways to involve employees in corporate programs. Corporate Social Responsibility projects (such as Habitat for Humanity builds, sorting food bank donations, or registering teams for a charity bike ride) or internal problem-solving competitions for specific issues (ranging from hackathons to projects resolving client pain points) are more than team-building exercises: They reinforce company values and allow staff to participate in corporate projects in fun, meaningful, and non-financial ways. Take the time to listen to your employees and don’t immediately jump to prescribing remedies. Instead, ask your employees for their ideas and implement solutions that need little lead-time (before putting into place more complex ideas). This way, you signal you hear your staff. Similarly, staff input when setting up a formal recognition program is important—don’t assume a gala or dinner with the CEO would appeal to the majority. ~ Rob Lokinger, President and Chief Operating Officer, AppCentrica Inc. Your behaviour, attitude, and presence go a long way in shaping corporate culture. Sit with your team to get a feel for their day-to-day environment and issues. Be seen. Have informal chats with specialists and coordinators as well as more senior staff at their desks or in the cafeteria. Encourage peers and people leaders under you to do the same. Trust in leadership is essential. Employees want to see the genuine you. Façades won’t gain their trust and may make you harder to follow. Your actions need to be consistent, and you must deliver on your commitments. Celebrate team wins, but also find ways that are personal to you to congratulate or acknowledge staff accomplishments. Equally crucial is being there and supporting your staff in challenging times. Annual and biannual employee satisfaction and sentiment surveys may not be helpful because they are lagging indicators. Instead, get timely feedback by measuring employee experience after critical points in their tenure: onboarding, first three months, performance reviews (etc.). Ask questions about diversity and inclusion, and track indicators such as employee referrals and attrition rates. Working with an experienced partner can help build and improve your employee engagement. Choose a partner who can efficiently lead the project, keep it on track, and who will develop your internal capabilities. The Burnie Group will help you to set the right strategy and build the right foundation. Contact us to learn more about employee engagement. TORONTO, May 28, 2018 — The Burnie Group is pleased to announce #EDGETalks: Actively Engaged – Leadership and Innovation in Building Employee Engagement. Featuring a keynote address by Norman Bacal, who, in his best-selling novel, Breakdown: The Inside Story of the Rise and Fall of Heenan Blaikie, recounts the cautionary tale of the perils of ignoring a firm’s culture and vision, and the danger of hiring as CEOs individuals with little to no management experience. “This event provides an opportunity for our clients and colleagues to discuss the very significant implications of employee engagement on organizational culture. As many of our clients are finding themselves in a rapidly commoditizing marketplace, organizational culture—and especially, employee engagement—remains one of the few competitive advantages you can leverage as a senior leader to grow and out manoeuvre your competitors.” says Darshan Jain, Head of Technology and Operations at The Burnie Group. With extensive research showing that organizations face a radically shifting context in the workplace, an engaged workforce should be a top priority for senior management. Converging issues such as flatter hierarchies leaving less 1:1 time with direct managers, accelerated career development expectations, and a technology-driven 24/7 work environment are driving the need to rewrite the rules of employee engagement. With so much on the line, what does it take for an organization to really understand its culture and create an inclusive and engaging corporate environment? The Burnie Group is a highly specialized operations consulting firm that helps clients improve their businesses through the application of innovative strategy, rigorous analysis, world-class technology, and top-tier domain expertise. The Burnie Group specializes in Strategy, Operations, Robotic Process Automation (RPA), Blockchain, and Workforce Management (WFM). 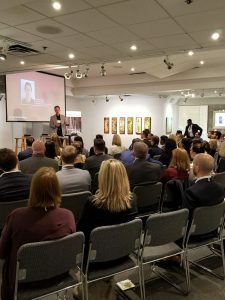 On January 15th, 2018, The Burnie Group hosted EDGEtalks: Executing on the Blockchain hype, the potential application of blockchain technology to business practices. The keynote was delivered by Don Tapscott (CEO, Tapscott Group; Executive Chairman and Co-founder, Blockchain Research Institute; Co-author, Blockchain Revolution). A panel discussion followed, moderated by Doug Heintzman (Head of the Blockchain practice, The Burnie Group). Panelists included Dr. David Jaffray (EVP Technology and Innovation, University Health Network), Dr. Marek Laskowski (co-founder, Blockchain Lab; Professor, Information and Computing Technologies, York University), Dr. Atefeh Mashatan (Professor, Ted Rogers School of Information Management, Ryerson University), and Chris Owen (VP, Enterprise Shared Platforms–Blockchain, TD Bank). In 2008, a person, or group, known as Satoshi Nakamoto, published a paper describing the first blockchain database. Three months later, it was used by Nakamoto to launch the bitcoin cryptocurrency network. Since then, interest in cryptocurrency investment has exploded, but industry experts insist that crypto’s true value lies in its underlying technology: blockchain. A blockchain is a distributed ledger technology. Its core value lies in its ability to provide a reliable common version of the truth to members of a business network. Digital records (transactions) receive a unique signature (hash) of a fixed length. Transactions are then bundled and stored in time-stamped “blocks” that are “chained” to the blocks of previous transactions. This chain of blocks is synchronized across a network of distributed “nodes.” By comparing the last hash in a chain, nodes find consensus on the contents and integrity of the blockchain, making it virtually immutable. This new technology was the first real solution to a problem that had plagued digital transactions since their inception: the double-spend problem The issue being that a digital payment was merely a copy of a token of value. Tokens could be copied multiple times and spent in more than one location. With blockchain’s continuous validation and replication of transaction history, single-use for digital tokens can be guaranteed. This, in turn, positively affects the trust deficit. Another valuable characteristic of the technology is “smart contracts,” which can be stored and executed on a blockchain. This coded feature enjoys the same immutability, and therefore trustworthiness, as the data it manipulates. It allows for the use of business logic with automated transaction attributes, solving, amongst other things, the renege problem. In this situation, a customer might leave a queue (reneging) for various reasons before completing a transaction. When a smart contract is introduced, the customer is no longer disengaged by redirection to a banking intermediary to complete the transaction. The smart contract easily completes the transaction by triggering and validating payment securely and independently. These problem-solving characteristics are representative of blockchain’s many potential advantages. The following will explain how blockchain can generate value, enhance business efficiencies, and bring about the new era of the Internet. Business networks are built on top of available infrastructure, which inherently contains deficiencies that can introduce friction into business activities. Many business networks, therefore, engage third-party intermediaries to mitigate deficiencies, such as trust deficits between parties. These third parties can take many forms: banks, credit card companies, insurance companies, PayPal, Alibaba, auditors, and regulators. However, this centralized intermediary system is hackable, infamously slow, and costly. Because a blockchain network addresses the trust deficit problem it allows for peer-to-peer transactions (P2P) completely independent of intermediaries. Individuals become owners of their own data, and that data an asset, protected on a blockchain from theft and fraud by immutable, time-stamped record keeping. In a blockchain-powered world, an individual’s medical records, financial records, academic degrees, voting history, professional history, and consumer history, can all be stored in encrypted transactions. A musician’s intellectual property might be stored on a blockchain, with smart contracts triggering automatic payments every time a song is featured in a film. A patient could allow a government temporary access to medical records to help identify and prevent possible outbreaks of disease. The sharing of this information with specific people for a fixed duration is the choice of the individual, un-beholden to the delays, rules, privacy exposure, or costs associated with an intermediary. According to Ronald Coase’s theory of the firm, companies only exist due to the high cost of transactions within markets. Traditionally, performing activities in-house has kept these costs low and companies strong. The Internet, created as a network of information, began the process of unbundling the firm. With the creation of blockchain as an entirely new network of information, these transaction costs are so greatly affected that companies have no choice but to evolve as the underlying rationale for their existence is altered. Blockchain features, such as smart contracts and autonomous agents, can cut costs by enhancing business efficiencies through automation. The scale of this automation can alter the very concept of what constitutes a company; a decentralized autonomous organization (DAO), for example, is a company run entirely through computer programs with next-to-no human participant. This model uses business logic and decision making embedded in smart contracts to automatically execute actions when triggered by pre-determined situational criteria. This new platform dramatically reduces business network friction, and eliminates nearly all traditional transaction costs, paving the way for distributed companies that resemble networks rather than centralized firms. Blockchain is a new paradigm that addresses the very purpose of computing: to automate business processes with the goal of reducing headcount and friction in business networks. It provides unprecedented peer-to-peer trust and can enhance business efficiencies in nearly any industry. When the existing Internet of Things—which is currently held back by the available software infrastructure and related trust deficits—is combined with blockchain’s new “ledger of things,” a partnership is formed. This partnership represents a second era of the Internet, in which discrete devices can confidently engage and contract each other to accomplish a goal. With widespread blockchain implementation, intermediary functions become redundant, companies more automated and decentralized, and the individual consumer more autonomous with improved privacy and increased control of their information assets. Working with an experienced partner can help you harness the full potential of blockchain technology for your business. As a leading professional services enabler of blockchain strategy and implementation in North America, The Burnie Group will help you to identify areas where blockchain can increase your business’s security and efficiencies, set the right strategy and build the right foundation to substantively advance business goals. Contact us to learn more about blockchain. 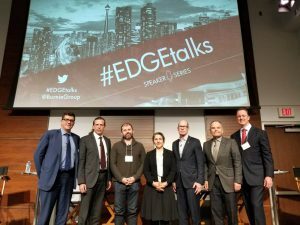 TORONTO, Jan. 09, 2018 (GLOBE NEWSWIRE) — The Burnie Group is pleased to announce #EDGETalks: Executing on the Blockchain Hype. Featuring a keynote address by Don Tapscott, Executive Chairman, Blockchain Research Institute, and Co-author Blockchain Revolution, this event will look at the dimensions of the Blockchain disruption and the business opportunities that it will create. “This event is an opportunity to bring together industry leaders to share their diverse insights and use case experience on the ever-evolving blockchain industry,” said Doug Heintzman, Blockchain Practice Leader, The Burnie Group. Blockchain technology has been the subject of great interest and investment. The potential of universal distributed ledgers to dramatically reduce transaction costs and reconciliation times has been well understood for some time, but only very recently have we had the ability to embed trust into business networks at a technology level. This evening looks to answer questions about where Blockchain technology is today, what its impact potential is, and how businesses are beginning to invest and implement it. On November 20, 2017, The Burnie Group led a panel discussion on enabling Robotic Process Automation (RPA) in the workplace. Moderated by David Burnie, Principal and Founder of The Burnie Group, panellists discussed their reasons for automation as well as key learnings from RPA implementation projects. Panellists were Erik Kalin, VP & COO of Retail Operations at Empire Life Insurance Co., Michael Marchuk, Chief Technology Evangelist at BluePrism, and Dan Semmens, Managing Director of Transformation-Process Automation at ATB Financial. When looking for ways to boost efficiency, improve service quality, or increase customer satisfaction, many companies turn to RPA to transform their businesses. Through automation, clerical tasks usually executed by people (for example, recording a change of address) are done more quickly and accurately by software robots. By removing mundane repetitive work, employees can be better engaged and contribute meaningfully to the company’s core mission. 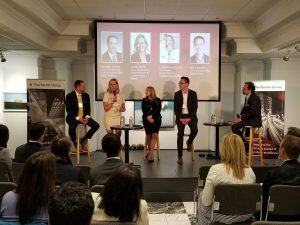 In this article, we’ve summarized some best practices step-by-step, and following that, some key learnings shared by the industry experts at our recent panel discussion. Every solution begins with a problem. Ideally, the issue should tie to the strategic plan or core business function. It could be people-focussed (such as issues related to high turnover or poor customer experience) or operations-focussed (such as evolving compliance requirements or complicated processes rooted in legacy systems). Engage your subject matter experts—including IT, risk, audit, and security—to develop a good high-level understanding of the processes and their related issues. You need to determine not just if automation is a viable solution but how much automation is needed for the best results. Here, RPA practitioners can build your knowledge (technological and otherwise) and provide resources to support your proof-of-concept. After determining scope, create a business case by defining the project’s objective(s). Recruit a senior level champion and socialize the plan amongst executive stakeholders. After the project is green-lighted, shortlist RPA process candidates based on stakeholder needs. Select an RPA practitioner to help manage your project. Build the team needed to put the transformation in place and support it, through the processes of change, implementation, and post-implementation. Your change team should include those functions needed for a smooth transition (such as communications, HR, and ER). A post-implementation team will need to deal with unexpected issues that may affect the robots after putting RPA in place (such as a vendor-initiated upgrade). Often companies do not have fully-documented processes, as tasks and behaviours may reside with the SME, but not on paper. Create well-documented, end-to-end understandings of full processes instead of spotlighting particular aspects. Develop thorough baselines. Find out who and how the final outputs are used. This step can be time-consuming, so be sure to budget sufficient time for your subject matter experts to thoroughly capture pre-RPA details. From Step 5, identify tasks (or entire processes) that do not add value, and those that can be harmonized or re-engineered to be improved. Build a Centre of Excellence and an object library. Stakeholders should also identify unexpected problems and find solutions. Schedule your development and sprints and adjust accordingly. Before going live, your communications resource should have developed and launched a communications plan targeting managers, staff, and other groups impacted by the RPA transformation. Ensure those who will be working with the new processes and those who are being redeployed have the appropriate training. Build in the necessary safeguards and checks to ensure all processes are being handled correctly. After the RPA is installed, objectively evaluate its performance. Conduct a gap analysis and determine if the business case’s goals were met. When monitoring stakeholder satisfaction, differentiate actual from perceived problems, and address them appropriately. Compare project costs and benefits against expectations. Capture lessons learned for future RPA (and other) implementations and document findings and recommendations. – Dan Semmens, Managing Director of Transformation-Process Automation at ATB Financial. – Erik Kalin, VP & COO of Retail Operations at Empire Life Insurance Co.
– Michael Marchuk, Chief Technology Evangelist at BluePrism. Working with an experienced partner can help make your RPA business transformation a success. Choose a partner who can efficiently lead the project, keep it on track, and who will build your internal capabilities. As a pioneer in North American RPA, The Burnie Group will help you to set the right strategy and build the right foundation. Contact us to learn more about robotic process automation.